The release of a photon of light from a molecule of Luminol is a fairly complex, multistage process. First for this reaction to work Luminol must be in a basic solution. This is necessary because, in neutral solution, luminol forms what’s known as a zwitterionic structure; that is, a molecule with both a positive and a negative charge. In a basic solution, it forms an anion, a negatively charged molecule which can exist in two forms (or tautomers), with the two negative charges delocalised on either the oxygen (the enol-form) or on the nitrogenous (the keto-form). A cyclic peroxide is then produced in a redox reaction involving hydrogen peroxide and a catalyst. The cyclic peroxide then decomposes to give Nitrogen and 3-aminophthalate. The reaction releases energy, which is transferred to electrons in 3-aminophthalate molecules, promoting them to their energy level. As the electrons drop down to a more stable energy level, they release their excess energy as photons of light, resulting in blue chemiluminescence. Luminol mixture, perborate mixture, copper sulfate, lancet, 5ml spray bottle, pipet (0.2ml). pipet (0.5ml), plaster, 2 x alcohol wipes, graduated test tube, plastic pot, nitrile gloves (medium), 0.05ml scoop, and 1 x totally awesome MP button badge. EXPERIMENT #1 COOL BLUE LIGHT This first reaction uses copper as a catalyst. All reactions must be performed in a dark environment in order to see the pale blue light which should last for about 30 seconds. Fill up the graduated test tube to 5ml with tap water. Don’t worry if you go over simply used the larger (0.5ml) pipet to get to the correct level. Take the lid off the clear plastic pot and pour the water into it. Repeat so there is 10ml of water in the clear plastic pot. Add two scoops of the perborate mixture into the clear plastic pot. Add two scoops of the luminol mixture into the clear plastic pot. Place the lid on the clear plastic pot and swirl the mixture until the solid has dissolved. The lid is purposefully not water-tight as gas is produced in the reaction, so be careful when swirling. Remove the lid and put in one scoop of the copper sulfate. Place the lid on and swirl the solution. At this point, blue light should be emitted. The used reaction can be washed down the sink. If you wish to repeat the reaction, make sure to thoroughly wash the clear plastic pot as tiny amounts of Copper Sulfate will catalyze the next reaction. EXPERIMENT #2 BLOOD CATALYZED REACTION This reaction requires a blood sample and therefore can only be performed once. The safety lancet is one use only and must be thrown away after use as well as the clear plastic pot and small pippet. DO NOT UNDER ANY CIRCUMSTANCES TRY TO REPEAT THIS REACTION USING THE SAME EQUIPMENT! Take the lid off the clear vial and pour the water into it. Repeat so there is 10ml of water in the clear plastic pot. Add two scoops of the perborate mixture (white solid) into the pot. Add two scoops of the luminol mixture (yellow solid) into the pot. Place the lid on the pot and swirl the mixture until the solid has dissolved. The lid is not water-tight as gas is produced in the reaction, so be careful when swirling. Next you will need to obtain a small sample of your blood using the safety lancet to be used as a catalyst. Before you collect a sample from your finger you must first clean it using one of the alcohol wipes. Twist the cap on the safety lancet and remove. Push gently against part of your finger you wish to get a sample form. This will activate the lancet mechanism making a small cut in the skin. Using the small pipet (0.02ml) take a small sample of your blood. Clean the cut on your finger using the second alcohol wipe and use the plaster provided. Place the sample of your blood in the clear plastic pot containing the perborate and luminol mixture. DO NOT UNDER ANY CIRCUMSTANCES TAKE A SECOND SAMPLE OF BLOOD! Dispose of small pipet. EXPERIMENT #3 LUMINOL SPRAY This experiment requires a sheet of paper. 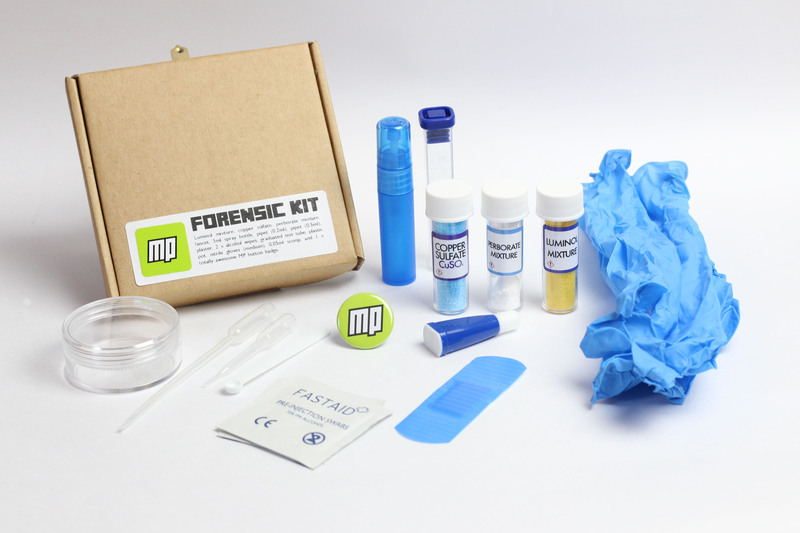 An activated mixture of Luminol can be sprayed on a crime scene to identify minute levels of blood. 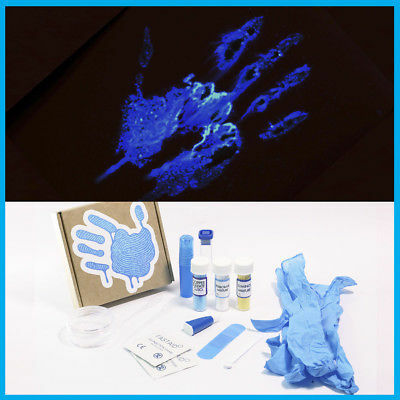 To get the same effect you can use a Copper Sulfate solution and use an activated Luminol solution to detect it. Fill up the graduated test tube up to 1ml with tap water. Don’t worry if you go over simply used the larger (0.5ml) pipet to get to the correct level. Add 1 scoop of Copper Sulfate. Place the lid on the graduated test tube and shake until dissolved. Pour the Copper Sulfate solution onto a piece of paper and allow to dry. If you are feeling adventurous you can make it look like a blood splatter. Warning – Copper Sulfate solution will stain. Take the lid off the 5ml spray bottle and add three scoops of both the perborate and luminol mixture. Fill the 5ml spray bottle with tap water. Put the lid on the 5ml spray bottle and shake until the solid has dissolved. Spray the paper using the solution in the 5ml spray bottle. The paper should glow where the Copper Sulfate solution has been applied. LUMINOL C8H7N3O2 Causes skin irritation. Causes serious eye irritation. May cause respiratory irritation. Avoid breathing dust/ fume/ gas/ mist/ vapours/ spray. IF IN EYES: Rinse cautiously with water for several minutes. Remove contact lenses, if present and easy to do. Continue rinsing. SODIUM CARBONATE Na2CO3 Causes serious eye irritation. IF IN EYES: Rinse cautiously with water for several minutes. Remove contact lenses, if present and easy to do. Continue rinsing. SODIUM PERCARBONATE 3Na2CO3•H2O2 May intensify fire; oxidiser. Harmful if swallowed. Causes serious eye damage. Keep/store away from clothing/combustible materials. Wear protective gloves/ eye protection/ face protection. IF IN EYES: Rinse cautiously with water for several minutes. Remove contact lenses, if present and easy to do. Continue rinsing. SODIUM PERBORATE TETRAHYDRATE NaBO3• 4H2O May intensify fire; oxidiser. Harmful if swallowed. Causes serious eye damage. May cause respiratory irritation. May damage the unborn child. Suspected of damaging fertility. Keep/Store away from clothing/ combustible materials. Avoid breathing dust. Wear protective gloves/ eye protection/ face protection. IF IN EYES: Rinse cautiously with water for several minutes. Remove contact lenses, if present and easy to do. Continue rinsing.If exposed or concerned: Get medical advice/ attention. COPPER SULFATE CuSO4 Harmful if swallowed. Causes skin irritation. Causes serious eye irritation. Very toxic to aquatic life with long lasting effects. Avoid release to the environment. IF IN EYES: Rinse cautiously with water for several minutes. Remove contact lenses, if present and easy to do. Continue rinsing. Dispose of contents/ container at an approved waste disposal plant.